I am delighted to offer this article from my good friend Teri Wathen, a Hearing Resource Specialist in Houston, Texas. We are a family of HoHs—the insider term for people who are Hard of Hearing. I wear two cochlear implants and my husband Ray wears hearing aids—sometimes. He lost some high-frequency hearing while firing weapons in Army basic training without wearing ear protection. And now, due to the aging process, he is losing even more. Our 38-year-old son Daniel wears one hearing aid and one cochlear implant. When he was a baby, I could not hear his cries in the night. Back then Ray’s hearing was better, and he would poke me to say the baby was crying and ask whose turn it was to feed him. I usually told him it was his. By the time Daniel was 2, I was concerned because he was not talking like all the other kids. The pediatrician said,“He’s a boy, boys are lazy, don’t worry about it.” I trusted the medical profession—and I didn’t want to think my baby had a hearing loss. Daniel was tested, kicking and screaming, at 2½, and I felt traumatized at not being able to join him in the test room. We didn’t want to believe the doctor’s diagnosis, but we got hearing aids on him and started speech therapy as soon as we could. He quickly learned that when Mom got on the freeway, he could throw his hearing aids on the floor of the car! Our second son, Blake, now 36, was tested and began wearing hearing aids much earlier; he now wears two hearing aids and thinks he can hear better than the rest of us. For years, I carried a lot of guilt about my boys’ hearing loss, because Ray’s loss was caused by the external force of firing a weapon. Several years ago, we attended a meeting about genetic hearing loss and, while we didn’t understand all the terminology, we learned about recessive genes that can cause hearing loss, and if each parent carries the genes, there’s a possibility (not a guarantee) of hearing loss in their offspring, which can then be carried to later generations. This knowledge relieved me of my guilt, but not the pain I felt for my sons and their hearing loss. 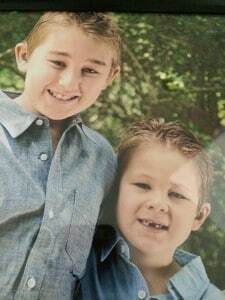 Blake now has two sons, Tristan, 13 and Lucas, 8, both of whom willingly wear their hearing aids, which Lucas calls “my ears.” Blake wasn’t happy about their loss, because he doesn’t want them to go through the effort and stigma that he and Daniel sometimes faced. I told him that because of his experience, he knows how to help his boys when they have questions or problems related to their hearing. I believe the foundation of positive support we have established in our family has benefited not only Daniel and Blake but also Tristan and Lucas. I love it when my grandsons spend the night. We are loud, boisterous, and full of “huhs,” “whats,” and “yeahs.” One night, I was getting ready to say good night to Tristan and bent down to give him a kiss. Unbeknown to me, he could see down my robe. He said, “I love your shirt” and proudly I responded “Oh, thank you!” I pulled my shirt out even more, only to find he had actually said, “Cover your shirt!” Thirteen-year-olds don’t wanna see down Nana’s robe! We have a hearing loop in our living room for the television. The sound stays low so we can hear each other when we talk. One day, Lucas, then 5, asked Blake to turn the sound on so he could hear the TV show. His dad told him to turn on his telecoils. Lucas didn’t know what he meant, so Blake showed him how to do it. Lucas was so excited because he could now hear the TV! He came up to me and put his ear beside my cochlear implant so he could hear through my telecoils, and then to Ray to hear through his. A hearing loss cute moment! Not so cute was the soft screeching sound that Daniel and I could hear, but the other hearing aid wearers in the room could not. We searched high and low and finally I asked Ray, “Is your hearing aid in your pocket?” Bingo—I always knew Ray’s shirt could hear well!! Starting with Daniel and Blake, and continuing with Tristan and Lucas (and Ray), we use the standard strategies of getting someone’s attention and facing them before speaking to them, making sure there are no obstacles (bright light behind them, hands over mouth, talking while walking away, etc. ), and not changing topics without advance notice. However, even our collective experience and knowledge about hearing loss does not always guarantee success in conversations. Ill health and daily stress and irritations can send us “off script,” causing miscommunications and misunderstandings, which sometimes lead to hurt feelings and personal frustrations. But it helps to have a sense of humor and our family certainly has that! We’re able to see the silliness in many situations and we try to humble ourselves while learning the lessons that will make our lives and the lives of others more bearable and joyful.